DOB: 1/1/2013 -- My New Years Baby Boy! Best New Years Resolution I EVER made!! "Bachelor Party" from Alethia Homestead in Southern California! Born early New Years morning! Thank you Dana and Siena!! Take a look at those udder pics from his 2 grandma's below! Can you say... MILK MILK MILK!! This boy is going to bring some INCREDIBLE udder capacity to his kids!! I am so incredibly happy to have him here! He is extremely long bodied, very open ribbed, very angular and dairy, and just a real sweetheart to boot! Both of his Champion grandma's have recently passed on, so his genetics here are even more special, since it is with those genetics that we got our start. We look forward to all the milk and incredibly beautiful body structure that BP will bring into our herd. His first 2014 kids are just GORGEOUS!! - BP's full brother is CH Algedi Farm JD Shotgun Wedding *B VVE 87 who easily earned his Permanent Championship his first season in the ring! UPDATE: I am loving my BP kids! They are so beautiful, dairy, ultra showy with beautiful dairy structure! 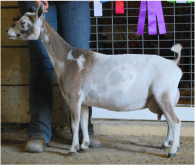 I've retained a gorgeous flashy buckskin doeling out of my Sweet Alyssum (Bellafire BP Flower Girl) and she placed 1st in her doeling class at the NWODGA show, then went on to win her Jr Grand Champion leg at the 2014 Oregon State Fair! 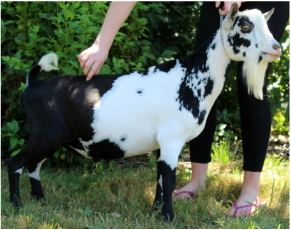 She also won 2015 Yamhill County Fairy Grand CH Jr. Doe as well, and 2015 Oregon State Fair Jr CH! ​2/11/2018 - ADGA search revealed that CONGRATULATIONS ARE DUE FOR ALETHIA JD BACHELOR PARTY "+*B! ​BP earned his "+" in late 2017 - YAHOO! Pictures below are property of Alethia Homestead, do not copy without permission of Alethia Homestead. Jasper is LONG as a freight train, with a very long wide loin. He has beautiful proportions, is long, lean, and flat boned. A very sharp dairy buck w/long legs and an extra long body. I would like to see him wider throughout, from front to back. He is as gentle and sweet as any buck I've ever owned. A real love-bug with a heart of gold. -- Jasper is returning to Castle Rock Farm in fall 2016! Thank you Sarah, I just know you will be so happy to have Tanzanite's brother back home! - sold to Tres Rios Farm - as you can see, he is very 'food motivated' lol! HetlandCreek TT 8 Second Ride "Ryder"
Ryder has put some VERY lovely and SUPER refined and dairy kids on the ground this year! I am very impressed! 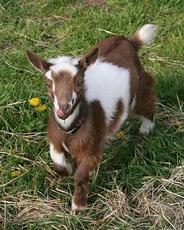 Unfortunatley Ryder injured/broke his front leg in an accident & was euthanized.